Live happily ever after with whimsical, brushed steel wallet cases that keep disorganized cash and cards from getting lost in your carryall. Choose from one of three, illustrated fairytale damsels by Caia Koopman: Little Bo Peep, Thumbelina or Little Red Riding Hood. Made in Los Angeles. Sold individually..
Care: Wipe down with a clean cloth. If item appears scratched, please remove the protective plastic film on the back of each case. I absolutely love it! I purchased the Little Bo Peep case. Adds just enough whimsy to your day. Have received lots of compliments on it! Cool box for business cards, coupons, lists,etc. Small and compact.Fun art. I love this product, the art is so pretty on the front, and the case is the perfect size to hold money, cards, ID's, and even my e-cigarrete. I love that it can hold all of that and that it is still small enough to fit into a pocket or small purse. And I have to admit, i love it when people say stuff like "that is so cute, where did you get it". strong, sturdy, well made. purses only; wouldn't want to sit on it in your back pocket. doesn't have the organized pockets, like traditional wallets, but you could squish everything inside. Fashion overcomes function here. Beautiful art and neat epoxy protection, but the metal is quite thin and it doesn't shut evenly. Definitely a nail breaker. Quite expensive for such flimsy construction. It's a pitty. Was thinking of getting other cases but not worth it. What a cute and practical gift! Say goodbye to Things Remembered, the boring silver case with the name engraved...ho hum...boring... this case is so cute, edgy, attention grabbing, and will give your new associate even more to talk about! It says so much about the holder at a glance, raises an eyebrow and makes you feel like you've got a secret! Highly recommended! This card case was purchased as a gift for my wife to accompany a new birthday purse. This case provides the right amount of flash and unique styling that I was looking for, combining a classic hard case concept with stunning artwork. The case is sturdy and holds every card that my wife usually carries with room to spare. The clasp holds the lid closed in all but the most violent of impacts with the ground (unintentionally tested on day one) and the small size allows it to fit neatly into a purse or hip pocket. I only wish it had more than one retaining clasp inside. AWESOME ARTIST IN A STAINLESS STEEL WALLET SAFE FROM CREDIT CARD HACKERS. LOVELY, HEARTY AND A MODERN TAKE ON AN ANCIENT FABLE CHARACTER- LITTLE BO PEEP. LOVE, LOVE, LOVE IT!!! The perfect wallet for young women! It's got all the personality and yet is simple and uncomplicated. I love this item. It would have recieved full stars but occationally it will over close and make it hard to open it. It holds everything from your credit cards to cash and works great. I think if they were to redo this with an elastic band instead of a clip it would be much better the money and cards wouldn't slide around. I would recommend this product to anyone. 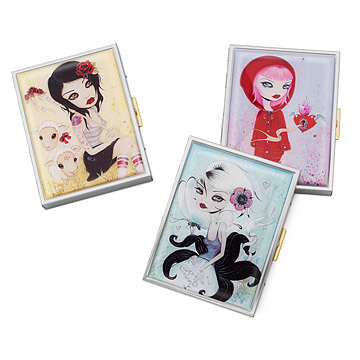 Live happily ever after with whimsical, brushed steel wallet cases featuring Little Bo Peep, Little Red Riding Hood or Thumbelina.